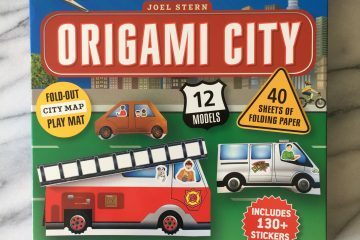 Japanese Origami Kit for Kids is packed with models and papers that are so much fun! It is a great beginner kit for young children around age 7 and 12. It comes in a box containing a booklet, a variety of unique print origami paper, and “practice” dollar bill paper. 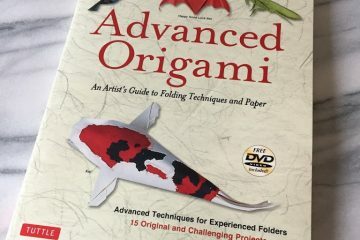 The origami papers were most exciting to me; they are so unique, I’ve never seen anything like these elsewhere. There are 72 double-sided papers, which come in 12 different patterns and color variations. Most of these prints are Asian-inspired, such as beckoning cats, pandas, fans, sushi, rice bowls, tea pots, fish, etc. I loved the panda print paper so much that I folded it in Miura-ori and used as a background for Kasahara Panda (note: neither model instructions are included in this kit). I got to share this kit with the campers that I taught at Willowbrook Arts Camp and Grace Art Camp recently. The fan model became popular and practical (folded out of scrapbooking paper, not included in the kit) during the summer heat. 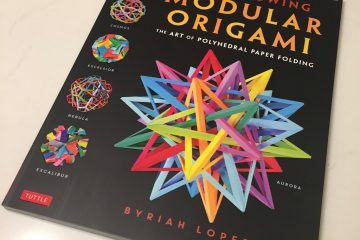 The modular wheel was another popular one, since it’s simple to fold and assemble, yet the result is satisfying. The wheel units get assembled securely together so unlike some modular models, this one won’t fall apart easily. A fan folded out of fan print paper. A modular wheel folded out of fish and sushi print paper. I must’ve been hungry. I recommend this kit to anyone, even to adults, and especially to crafty children on travel, since this kit has all that is needed to entertain a child on-the-go, without any messes or tools.